We discuss the legendary engineers of analog electronics with Linear Technology’s Todd Nelson. Jeff and Brian discuss how analog computers have been replaced by digital computers, but digital signals have to be treated as analog waveforms as the bandwidth increases. Brian references the video game Asteroids in making an analogy about the relationship between analog and digital signals. Our guest for this episode is Todd Nelson, an applications manager at Linear Technology, and author of the Analog Footsteps blog. Although he started off as a mechanical engineer working at GM, Todd returned to school to get his master’s degree in electrical engineering. Leveraging his prior work experience, our guest landed a marketing job covering the automotive industry for National Semiconductor. He eventually worked in the marketing, design and applications groups at Linear Technology. A number of analog semiconductor companies are located fairly closely to one another in Silicon Valley, including Linear Technology, Intersil, Maxim Integrated, and Fairchild Semiconductor. Semiconductor fabrication plants, or “fabs,” are manufacturing facilities capable of making integrated circuits. Linear Technology is still selling the LT1001 op-amp that it designed in the early 1980s. Semiconductor manufacturing equipment is often classified by the diameter of the silicon wafer it can handle. Todd was motivated to start his blog about the history of analog electronics, Analog Footsteps, after the untimely death of legendary analog circuit designers Jim Williams and Bob Pease. 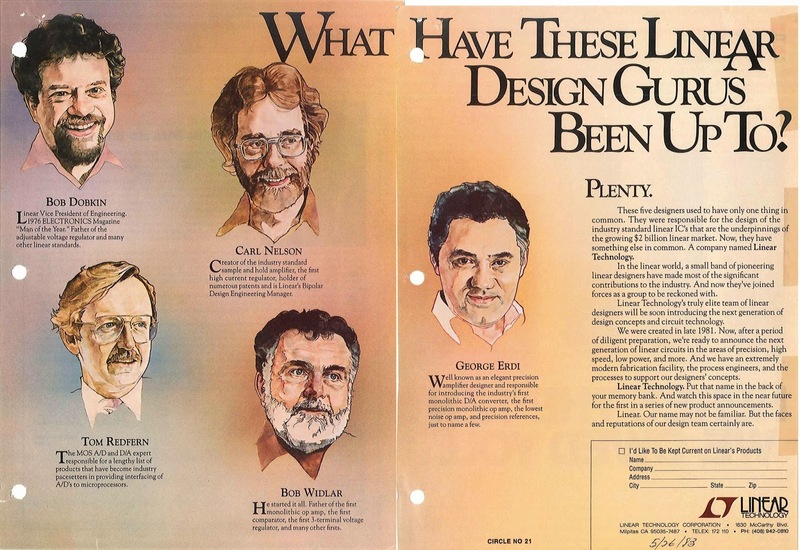 When Linear Technology was getting started, it promoted five design “gurus” in a magazine ad: Bob Widlar, Bob Dobkin, George Erdi, Carl Nelson, and Tom Redfern. A 2006 video interview with Jim Williams and Bob Dobkin is available on the Silicon Genesis website. As described in Tom Wolfe’s book, The Right Stuff, the fame associated with Chuck Yeager‘s breaking of the sound barrier was so significant that Yeager’s West Virginia drawl became the standard for all forms of aviation speech. Bob Widlar was amazingly prolific as a designer, and also incredibly difficult to manage as an employee. Carmen mentions the story of Bob Widlar and Bob Dobkin building a circuit to steal cycles from the wall outlet of National Semiconductor executive Pierre Lamond, thus causing his synchronous clock to lose time each day. Todd describes the ability of young engineers to change entire industries in his post, When 30 Was Old. Bob Pease was an analog circuit designer and author who wrote a lot of application notes, as well as authoring the books Troubleshooting Analog Circuits and How to Drive Into Accidents – and How Not To. Bob Swanson was the “business guy” who figured out how to make Linear Technology profitable in its early years, serving as the company’s president from 1981 to 1999, and its CEO from 1999 to 2005. Carmen mentions a blog post about Einstein’s amplifier design. The Philbrick Op-Amp used vacuum tubes to generate the desired electronic functions. Todd references the story about Bob Widlar bringing a sheep to eat the grass in front of National Semiconductor. Nello Sevastopoulos was a world-class athlete who later became LT’s sixth “guru,” known for his work on monolithic and integrated filters. Todd can be found on Twitter as @AnalogFootsteps. 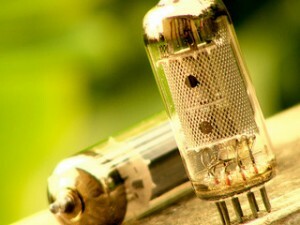 Thanks to Rony B. Chandran for his photograph titled “Vacuum Tubes.” Podcast theme music by Paul Stevenson. Glad you are enjoying the podcast! Any topics you’d like us to cover in future episodes?